Maariv report claims in private meeting Netanyahu and Putin forged security pact for Israel's safety. A pact was forged between Moscow and Jerusalem to ensure Israel's security during a private meeting last month, according to a Friday Maariv report. The report claims that a 90-minute conversation took place between Prime Minister Binyamin Netanyahu and Russian President Vladimir Putin during Netanyahu's last-minute attempt to prevent an interim nuclear deal between Western powers and Iran. While Moscow - which has been rumored to be involved in a nuclear arms deal with Tehran - refused to accede to Israel's stance on the nuclear Iran issue, Putin did allegedly promise to ensure Israel's security in the region. Netanyahu asked Putin "not to push" the demilitarization of the Middle East from all nuclear weapons, according to the report. Israel has faced mounting international pressure to sign the UN's Nuclear Non-Proliferation Treaty. Netanyahu stressed to Putin that threats to disarm Israel of its nuclear weapons - which have never been officially confirmed by Israeli officials but are widely thought to be in Israel's possession - would harm Israel's interests in the Middle East. Putin, surprisingly, agreed to the proposal. "Russia will block efforts to convene the nuclear arms conference," he allegedly promised Netanyahu. 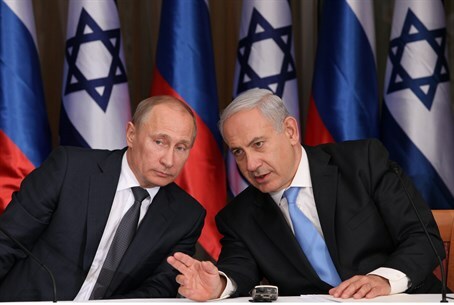 Putin even made ​​it clear to Netanyahu that Russia will not do anything to harm Israel. He added that despite the close relationship between Israel and the US - with whom Russia's relationship is strained - Russia would nonetheless stand by Israel's side and offer aid in the event of a conflict against it, according to the report. US President Barack Obama reportedly objected to the pressure on Israel in 2010, but later backed down, in a move widely panned by Israeli officials. The Obama administration's policy of non-intervention in the Middle East - including failed threats of a Syria strike and ambivalence about a nuclear Iran - has irked Russia and strained the relationship, the report claims. Putin and Netanyahu allegedly united over the common dissent with the US's policy over the region. The newly revealed pact with Russia coincides with a growing rapprochement between Israel and China. The deepening ties were highlighted in Chinese Foreign Minister Wang Yi's first visit to Israel this week. The report contradicts evidence indicating that Russia is involved in arming some of Israel's most formidable threats, including Iran, Syria, and Egypt. Russia was reportedly among the most vocal supporters of the Nuclear Non-Proliferation Treaty, and came out against Israel's rumored possession of nuclear weapons earlier this year. Before last month's meeting, an expert from the Hebrew University of Jerusalem dismissed claims that Israel has been playing off tensions between Russia and the US. "I very much hope that (Netanyahu) will not try such an exercise," Amnon Sela, professor emeritus of international relations, told AFP. "I think he has already taken some steps which are very harmful to Israel, with his opposition to President (Barack) Obama and trying to enlist (US) public opinion and Congress against the president, and in particular the American Jewish community which immediately raises the question of dual loyalties." Even if Russia would like to fill the gap, it lacks the resources, he said. "It is not capable of playing any role beyond that which it already has, in Iran, Syria and (Lebanese terrorist group) Hezbollah." "It has no possibility; not economically, nor diplomatically," he said, adding that "it could act only together with the United States."